A Review of "Nancy Drew: Secrets Can Kill"
Nancy Drew: Map: Small Town, Big Secrets...Secrets Can Kill (SCK), originally released in 1998 by Dreamcatcher, is the first of Her Interactive's licensed Nancy Drew graphical adventure games, and it's a rich and rewarding experience. It's set in a small town in Florida, where the murder of a local high school student and plenty of suspects peaks Nancy's curiosity to the "boiling point." The game is chocked full of clues, codes, and Easter Eggs--and puzzles galore. In short, it's a great game for all ages and both sexes, and even educational to boot. It's a well designed GAG with lots going for it, so if you see it, grab it--you won't be disappointed. A Review of "Missing Since January"
Missing Since January: The SKL Network, the in-game homepage.Missing Since January (MSJ), re-released in 2004 by the Adventure Company, is an American re-release of a game called In Memoriam, developed by the French Lexis NumÃ©rique company and published by Ubisoft SA and Dreamcatcher Interactive in 2003. The big gimmick is what I might call a "virtual reality" setup--playing the game requires moving beyond the program itself and doing Google searches. Players will also periodically receive emails containing clues or information, some of which are vital. It's pretty easy to see the problems that could arise from this setup, but it works. Plus, considering the game is now selling for $10 in various retail bargain bins (I got mine at Best Buy), it's definitely worth checking out. 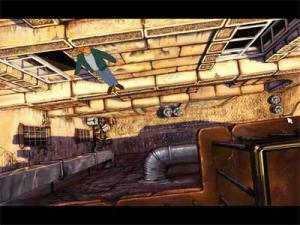 Broken Sword: Don't look down!Although there were certainly aspects of Broken Sword: Shadow of the Templars that I admired, and others that I enjoyed, I have to admit I found playing through this title an exercise in tedium. The key problem is poor pacing (snail race, anyone? ), which amounts to a collosal amount of dialogue to sit through, a somewhat clumsy narrative technique, and what feels like hours spent watching the avatar slowly plod and backtrack across the screen. Compared to similar games like The Dig and Gabriel Knight: Sins of the Fathers, Broken Sword just doesn't make the cut. Barton's Review of "Gabriel Knight II: The Beast Within"
Gabriel Knight 2"Gabriel Knight 2: The Beast Within" is an interesting game for many reasons. For one thing, it's one of the first games to incorporate full-motion video, and it does so effectively. 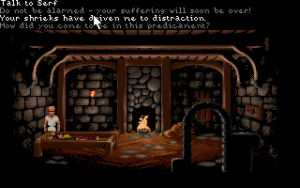 Unlike Sierra's other pioneering CD-ROM project, "Phantasmogoria" or Trilobyte's "The 7th Guest," GK2 is still winning over new players today. The reasons are clear: GK2 has all the eyecandy of the other games, plus great characters, good drama, an interesting storyline, and challenging (yet not unsolvable) puzzles.